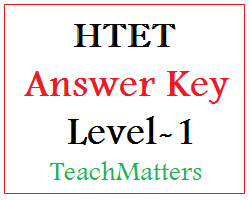 (Last Updated : 20.11.15) See/download HTET Answer Keys 15-11-2015 of JBT for Level-1. HTET Level-1 exam was held on 15 November 2015. The candidates appeared in HTET 2015 exam for level-1, can see HTET answer key of HTET exam 15-11-2015 with answer option and solution for Code / Set - A, Set-B, Set-C, Set-D & Set-E.
HTET JBT Answer Keys of HTET Nov. 2015 published here is official. Official Answer key of HTET 2015 for level-I (PRT) will be uploaded by HBSE after some dayson 20.11.2015 on the official website i.e. www.hbse.ac.in or www.htet.nic.in. You can see HTET PRT Answer Keys Nov. 2015 below. HTET Answer Key published here is official. For other sets - Set-A,C,D,E use this answer solution. Answer key will be updated at regular interval, so visit this page regularly.